Our first few sessions help parents recognize their long-term aim and the value of maintaining and building their relationship with their teenager(s). 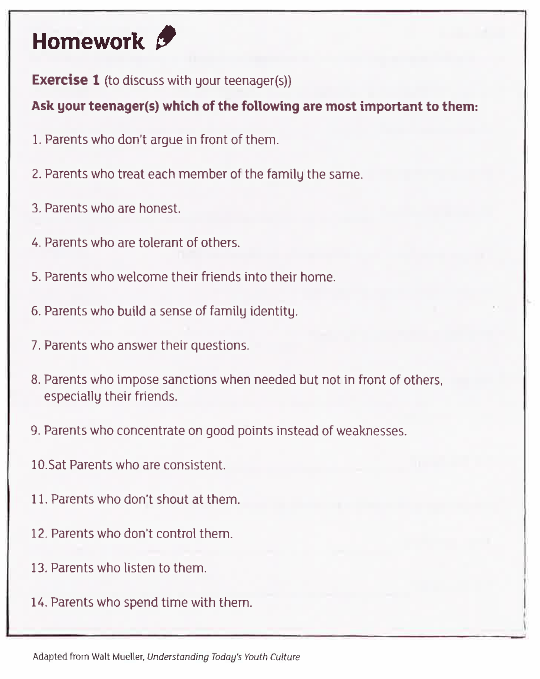 The speakers said – parenting is about loving our teenagers effectively. What do you think this kind of love should be like? Welcome to the first day of the Parenting Teenagers Course! Why has no one else commented? Because we’ve just launched, and you’re one of the first to enjoy our new app and web site. Please feel free to comment and ask questions in this space. With my children being 11 & 13 (really just starting the teenage years), love is taking a deep breath/not exploding with frustration when house rules are not followed i.e. bring dishes to kitchen, put dirty laundry in laundry bin, etc. Thanks for joining us, Clare, and for sharing your answer! When I hit the discussion guide after viewing day 2, I get day 7 info then with day 3 I get day 8 info. Sorry about that – should be all fixed now! This is an amazing gift and tool you have provided. Thank you. As a parent of a 12 year old I find it hard not to pull my hair and scream and shout sometimes, but in the end it comes back to love and how without it how can we raise our kids to be respectful, caring people. Thanks for the great feedback – enjoy the course!